Hot on the heels of Ballymoney Blaze finishing runners-up in the league and winning the Northern Ireland Volleyball Cup for the first time is the news that they will now compete in Europe, writes GILLIAN ANDERSON. The Ballymoney outfit will contest the CEV Volleyball Challenge Cup and they get their campaign underway against Kosovo’s champions Drenica R&Rukolli Skenderaj. Ballymoney Blaze are the first team from Northern Ireland to play in the European Cups since the University of Ulster participated in the 2007-2008 edition of the CEV Volleyball Challenge Cup. 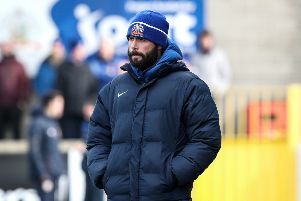 Coach Johnny McClenaghan explained how the club’s European adventure came about. “When we won the cup there were a few questions from the guys about entering Europe. It was something we had joked about, but based on the amount of time since the last Northern Ireland entry it was just the guys having a laugh, nothing was ever considered seriously. “I’m also the general secretary of Northern Ireland volleyball so I made an enquiry with CEV to ask if there was the possibility we could enter for this coming year. The response I got was that we had missed the entry deadline but we could apply for special dispensation from the CEV President André Meyer, and it would need to be within the next hour. So I sent off a quick email, they granted us conditional entry but only after a very late night and the completion of a number of forms. It’s been eight years since the last Northern Ireland team competed in the Confederations Cup and Johnny explained some of the reasons. “Firstly we’re a small country with small amateur teams, so some of the clubs may not have had the desire to enter although the main reason is potentially the cost implications. “It will cost a minimum of £2000 before we even touch a ball and all of that will be self funded. Then we have to pay for our flights and accommodation for the away game, plus entirely new kits. So it’s going to be a costly venture. So over the coming weeks and months we’ll be running a number of fundraisers and most definitely will be looking for sponsors to support us.